Cortisol is a hormone released from the adrenal gland during stress. It’s involved in immune function, glucose metabolism, insulin release and inflammation. Chronically high cortisol levels can impair your cognitive performance, decrease muscle tissue, suppress thyroid function and increase visceral fat. Evidence indicates that vitamin C taken in the right dosage might reduce cortisol levels. Consult your health care provider before taking vitamin C supplements. Vitamin C might reduce cortisol levels, according to an animal study performed by researchers at the University of Alabama in Huntsville. Researchers put rats under stress for one hour per day for three weeks and then gave them 200 milligrams of vitamin C or a placebo. 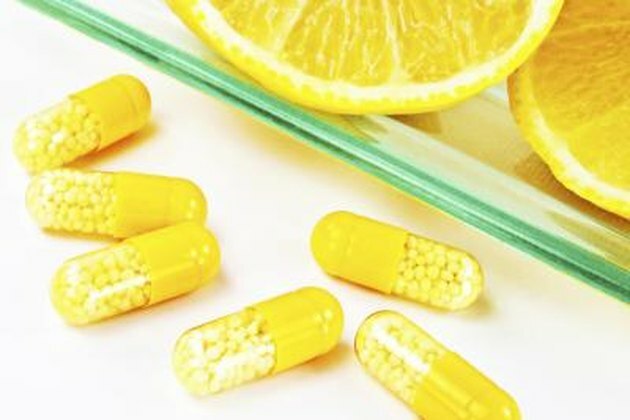 According to Science Daily, rats given vitamin C experienced decreases in cortisol and other stress hormones compared with those consuming a placebo. According to Psychology Today, a human study showed similar findings. German researchers investigated the effects of vitamin C supplementation on participants undergoing a public speaking task, which is considered a stressor. Subjects were given 1,000 milligrams of vitamin C or a placebo before performing the task. Scientists found that those in the vitamin C group had lower levels of cortisol and blood pressure compared with those not receiving vitamin C supplementation. In addition, participants in the vitamin C group felt less stress than did the non-vitamin group. Vitamin C seems to be effective in lowering cortisol in the dosage of 1,000 milligrams. Keep in mind that adding large doses of vitamin C too quickly may lead to diarrhea and stomach upset. Therefore, gradually increase your intake of vitamin C.
Vitamin C supplementation might interact with certain medications, including aluminum-containing antacids, aspirin, Tylenol and chemotherapy drugs, according to the University of Maryland Medical Center. If you’re currently taking any of these medications or others, consult your health care provider before taking vitamin C supplements.